An alarming study reveals that honeybees are picking up pesticides from a number of unlikely sources. Honeybees living in agricultural regions have been exposed to pesticides for quite some time, but a recent study reveals that the threat goes just beyond crop plants. According to a report from UPI, honeybees pick up pesticides as they forage for pollen from non-crop plants in addition to commercial crops. A team of scientists from Purdue University broke down the different sources bees use to gather pollen over the course of a 16-week period. Analysis of samples taken from the bees’ hives revealed that they had gathered pollen from 30 different plant families, and contained traces of nine different chemical classes of pesticides. 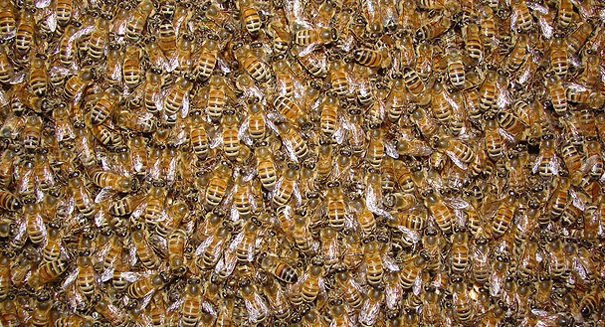 Among them were neonicotinoids, a notoriously harmful pesticide to bee populations. Krupke says agricultural chemicals pose a significant threat, but they are only a part of the problem. Other big contributors to the problem of chemical exposure include homes and urban landscapes, and the substances used to maintain these environments. The study, published in the journal Nature Communications, also revealed that pyrethroids, commonly found in anti-insect sprays and gels, were found in the pollen samples. Krupke’s post doctoral assistant at the time, Elizabeth Long, echoes his concerns. “The findings really illustrate how honeybees are chronically exposed to numerous pesticides throughout the season, making pesticides an important long-term stress factor for bees,” she said. A press release from Purdue University describing the details of the study can be found here.